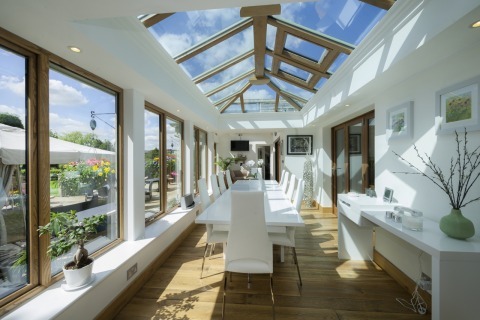 The traditional orangery provides a structure of real impact, particularly when specified with our Opus windows & bi-folding doors. 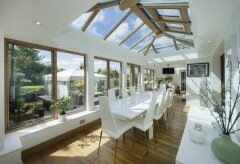 A traditional orangery is a thermally efficient and visually stunning and will prove to be is a wise investment for your home. 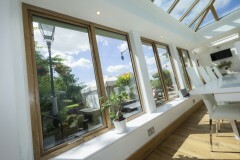 A thermally efficient and visually stunning addition to your home. 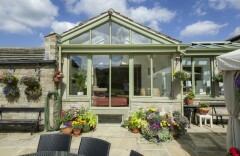 There are many forms of orangery available but none are as impressive as our traditional orangery system. 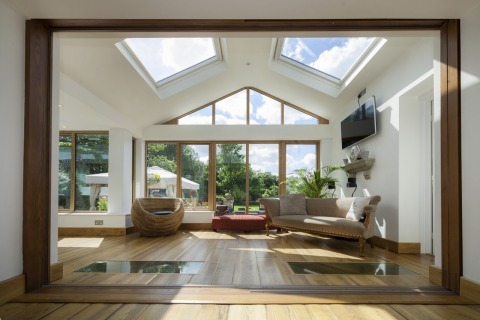 The fundamental difference between the traditional orangery and our Livin room conservatory is the ‘flat deck’ WARMroof construction around the perimeter of the roof. 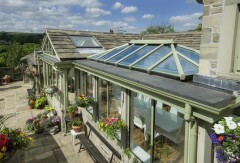 This WARMroof is installed fully insulated providing a thermally efficient roof structure around the glass lantern section. This flat deck also creates a structure robust enough for the weight of the glazed area, each individual structure is checked to ensure it is fit for purpose and calculations can be provided for building control compliance. 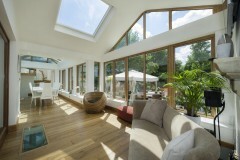 The glazed skylight area in the center allows the room to be flooded with natural light. 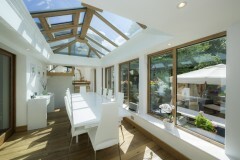 Thanks to the WARMroof deck, the improved thermal performance of this glazed extension allows for the kitchen or adjoining room to be opened up into the new traditional orangery extension and is still fully compliant with current building regulations. 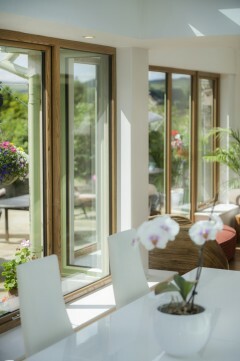 The perimeter windows are constructed from our Opus range with real hardwood ash on the inside. 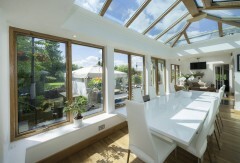 The real timber inside is beautifully detailed, warm to the touch and can be finished in a variety of lacquers, stained or even painted to suit. 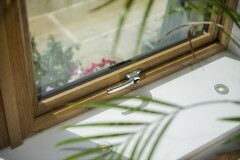 Externally our Opus window is made from aluminium, structurally robust and virtually maintenance free. 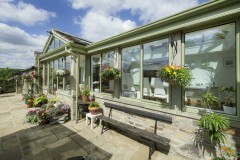 All our Opus range of windows are hand built in our factory by time served craftsmen. 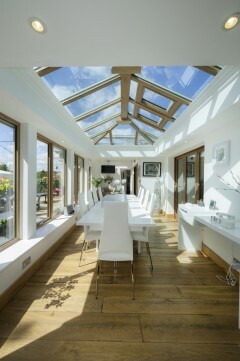 Traditional Orangeries make an ideal kitchen or dining room extension. 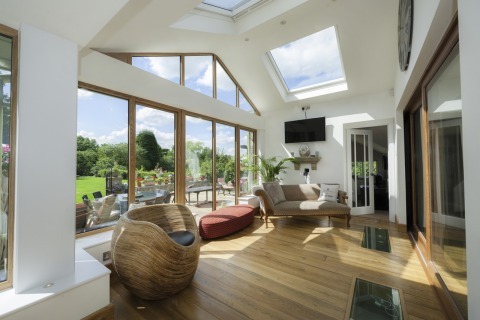 They are rooms created to live in and are certainly not an occasional room which will make them the focal point of the home. 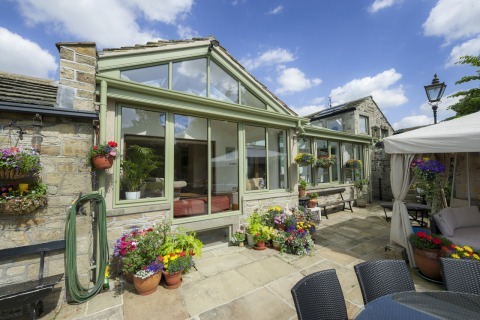 Adding a grey or black colour to the exterior with aluminium frames or even bi-folding doors leading into the garden will provide a real contemporary look and feel to the outside. Alternatively our Opus range of hardwood timber will match wood floors, furniture or even kitchen units. An orangery is a glazed extension and truly flexible living space which will add real value to your home. 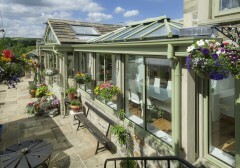 A wide selection of options are available, allowing you to customise your Opus “Traditional” Orangery down to the finest detail. 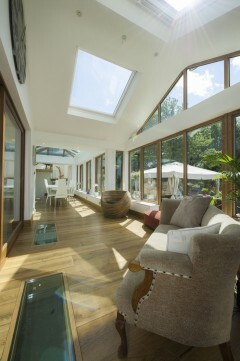 Allow light to flood in through the roof providing an airy, warm feel throughout the day. 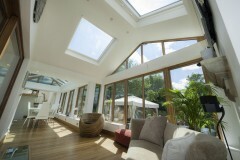 An alternative roof provides maximum energy efficiency, providing excellent climate control all year round. 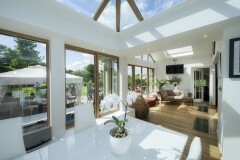 Open your Orangery up onto the garden with stunning full-span Bi-Folding doors. 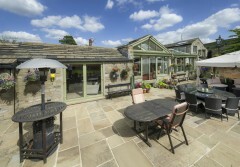 View some example builds by our team of Registered Installers.